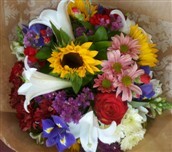 WE SEND AND DELIVER FLOWERS ONLINE TO ALMOST ANY ADDRESS IN CANADA AND THE UNITED STATES OF AMERICA (USA) OR THE WORLD. WE GUARANTEE DELIVERY OF QUALITY FLOWERS VIA INTERFLORA. Daily deliveries throughout the United States of America.